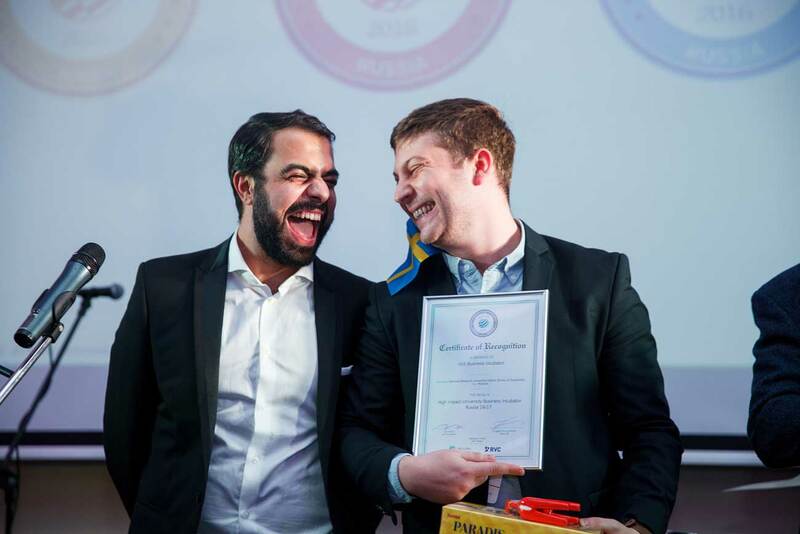 Ali Amin, CEO, UBI Global (left), granting certificates of recognition to the best Russian accelerators. "One of our students developed a material that produces toys twice cheaper than in China," said Oleg Revin, director of the Captain Russia business accelerator at Plekhanov University in Moscow. "Today, in his third year he has his own business." Captain Russia is just one Russian accelerator whose effectiveness was assessed this year by UBI Global that benchmarks business incubators and accelerators worldwide. In terms of effectiveness Russian incubators and accelerators lag behind Europe and the U.S. UBI said, however, that considering their relatively young age, small budgets and small staff numbers, Russian programs have made great strides in a short period of time. Amin believes the next several years may see an "explosive growth" in the number of startups in Russia and Brazil. "Russia has advantages such as proximity to Europe and Asia, while Brazilian startups have better chances in the U.S. market," said Amin. Some Russian accelerators, such as Pulsar Venture Capital in Kazan, use their proximity to Europe to better position startups in this market. Pulsar, for example, opened a representative office in Ireland. "Most Russian companies from the provinces believe they must first go to Moscow and then move to Europe," said Pavel Korolev, Pulsar general director. "But our experience shows that this is not necessary, and it's possible to enter the international market directly." Russian incubators and accelerators are much younger than their international counterparts, with an average age of seven years old, compared to 11 years in Europe. This is why they have business models that are significantly different from European and global ones, said UBI. Russian accelerators, for example, generate more income from events. Most Russian accelerators at the top of the UBI ranking said they benefited from international cooperation. ITMO University in St. Petersburg, for example, launched a program this year for female entrepreneurs together with UCLA in California. Technology developments in Russia are hindered by bureaucracy and the lack of capital for the initial phase of a startup's development, said Amin. Investment by venture firms in Russia declined in the first nine months of 2016, according to an analysis of 250 firms made by the Russian Venture Capital Association. "Previously, the market grew thanks to companies that evolved in the 1990s and 2000s when venture firms that focused on the middle and late stages would 'cherry-pick' these businesses," said Evgeny Kuznetsov, head of the Russian Venture Company. "But by 2013-2014 there was a shortage of startups to invest in." Kuznetsov added that venture firms are now beginning to consider tech companies at an earlier stage of development, and he is convinced that in the next two to four years the investment market in Russia will begin to grow thanks to the appearance of new startups.